Hi, All! Thank you for your patience, I know it has been awhile since our last featured bride! After a busy wedding season, we are very excited to announce our newest addition, “The Sample Shop by HCTB”, our new online marketplace where you can save hundreds (or thousands) on our designer bridal samples, delivered to your door. 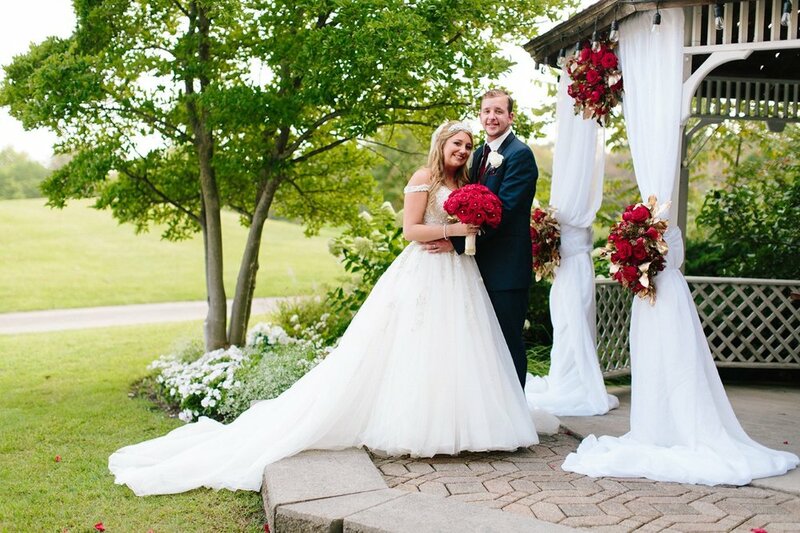 We are so excited to feature our beautiful #HCTBRIDE, Nikki. Enjoy! Nikki first met Brad at a party she was having at her house. Her cousin’s husband invited him and when they started mingling, they discovered that they had several mutual friends. They also went to the same high school, but never crossed paths due to them being a couple years apart. After hitting it off at the party, they started casually getting together. Their friendship then blossomed into a beautiful relationship, falling in love with each other. The rest, as they say, is history! Nikki’s family, together with Brad, surprised her for her 30th birthday with a trip to Disney! Little did Nikki know, another surprise was coming. In front of Cinderella’s Castle, Brad proposed! Nikki’s favorite Disney movie was Beauty and the Beast. 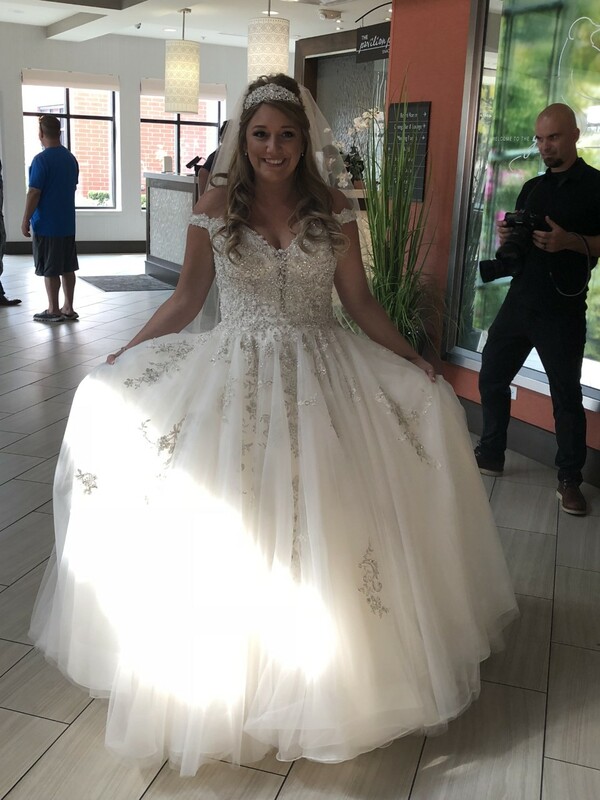 For her wedding dress, she was inspired by Belle, wanting an off-the-shoulder, princess cut ballgown. She looked absolutely stunning in her Essense of Australia ballgown. TALK ABOUT A BEADED BEAUTY! This princess wedding dress from Essense of Australia is sparkling from shimmering off-the-shoulder sweetheart neckline, to a twinkling, full tulle skirt. Lace and tulle over Regency organza create a gorgeous ballgown that is covered in rich silver beading and silver edged lace. Elastic off-the-shoulder straps offer a unique take on this trend while subtle lattice beading bring a Rococo element to this princess dream dress. The antique beading around the neckline feels both romantic and glamorous paired with the sweeping train. 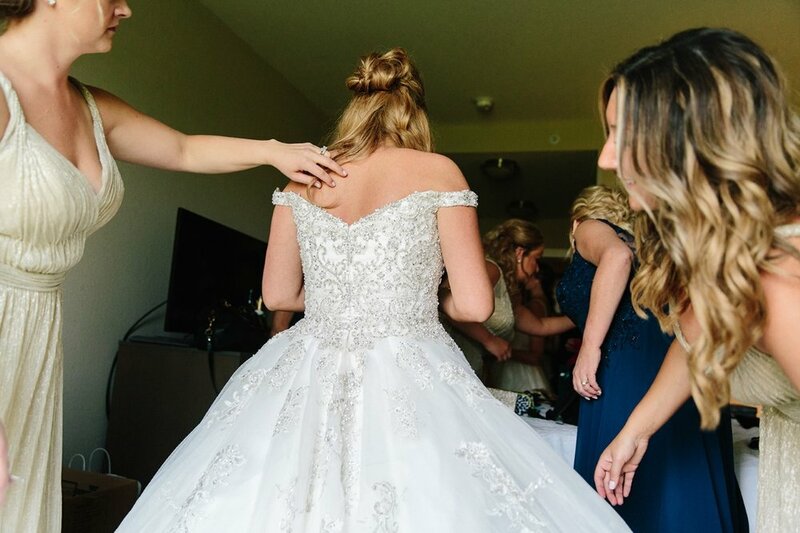 The back of this princess ballgown zips under crystal buttons. 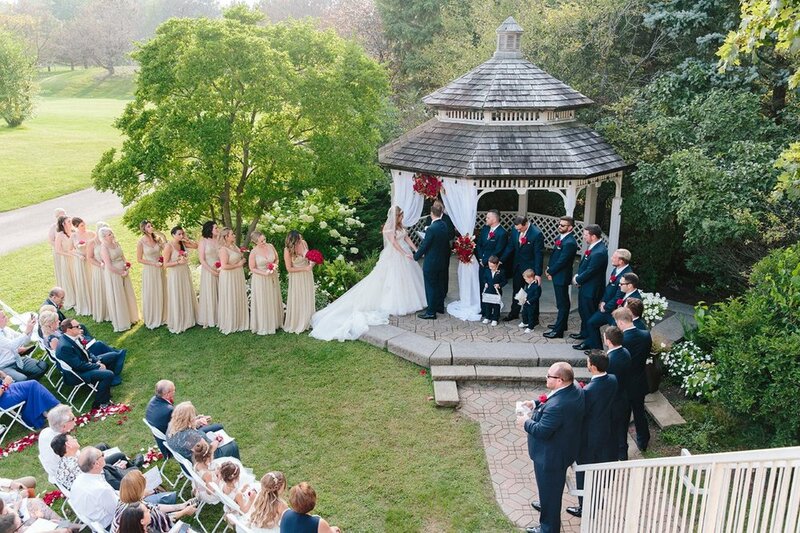 From all of us at Here Comes the Bride, we wish Nikki and Brad a lifetime of love and happiness. 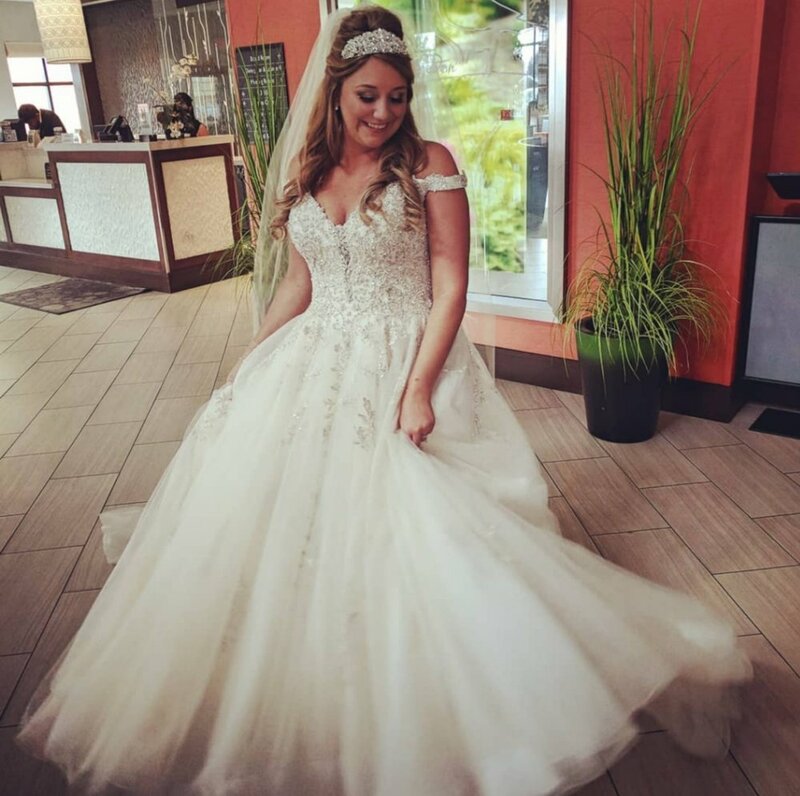 You looked absolutely stunning on your big day! It was a pleasure getting to know you and sharing your story. Would you like to be featured on our blog? 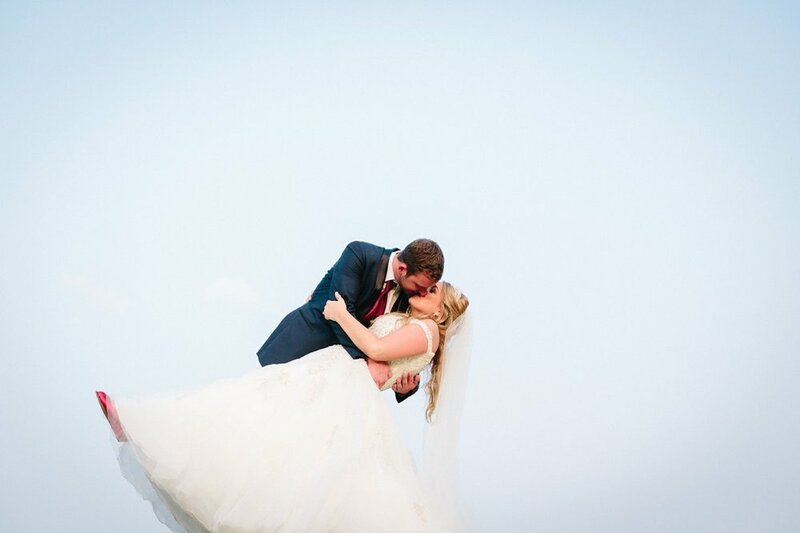 Click here to learn more about how you can become a featured #HCTBRIDE.